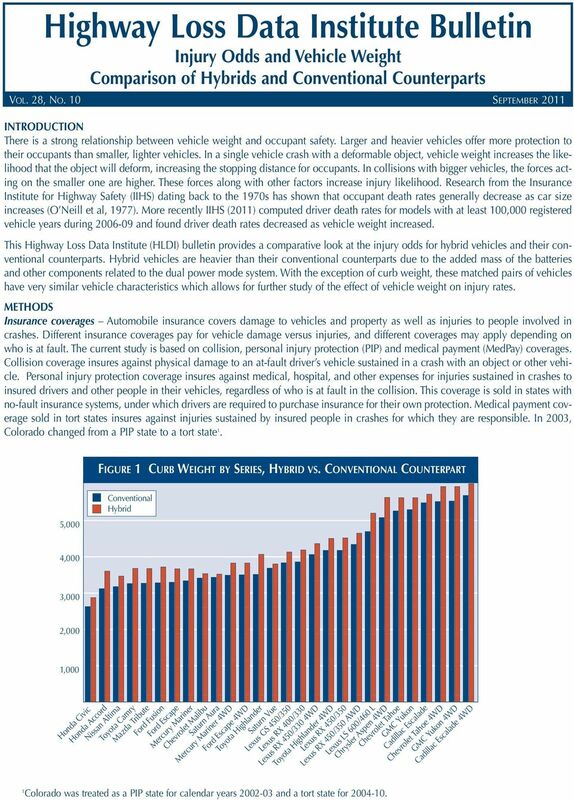 Download "Highway Loss Data Institute Bulletin"
2 Concurrent coverage and injury odds Concurrent coverage means a vehicle is insured under two relevant coverage types at the time of the loss. To have concurrent coverage a vehicle must have the same policy period for both coverage types (Collision and MedPay, or Collision and PIP). In addition, claims data for both coverage types are joined to see whether there are any associated claims. 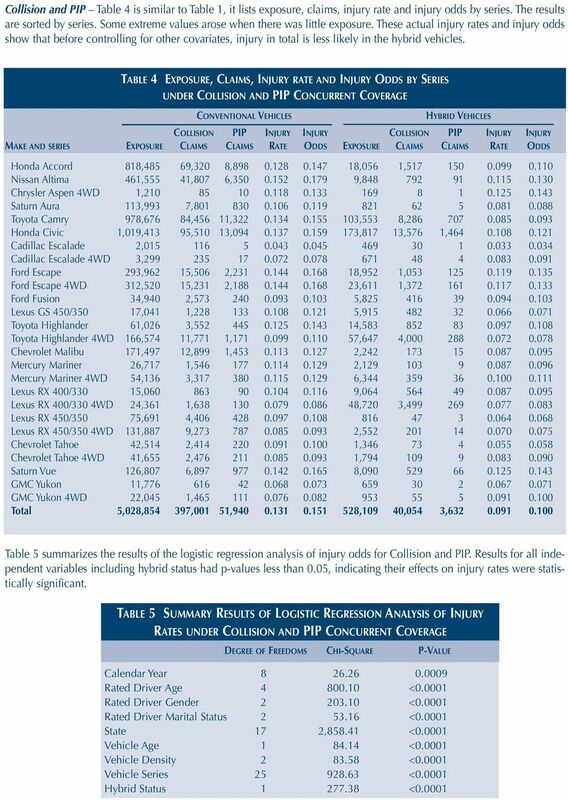 Injury rates are defined as the proportion of collision claims with an associated MedPay claim or PIP claim. 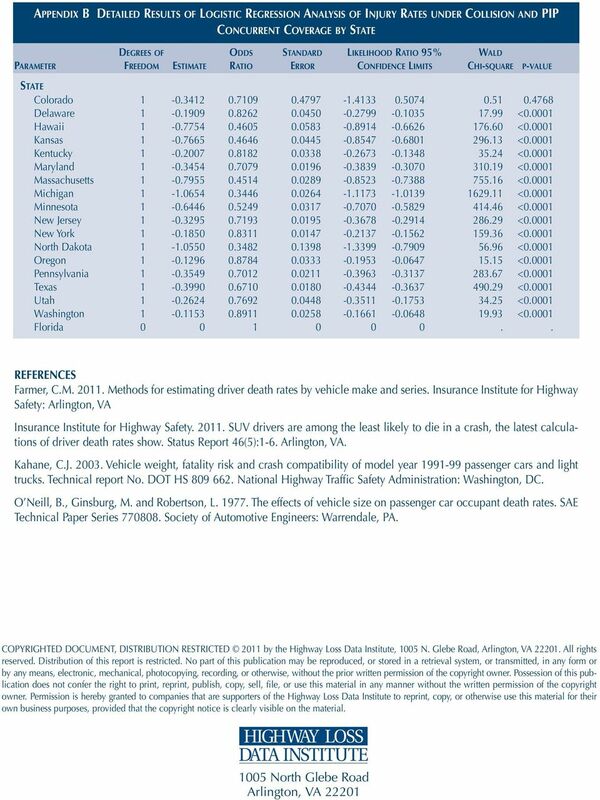 Injury rates (π) measure how likely it is that for a given crash, a collision claim will produce a MedPay or PIP claim. Injury odds are defined as π/(1-π) and they provide another way to measure injury risk. Injury odds are very close to injury rates when injury rates are small (π<0.1). 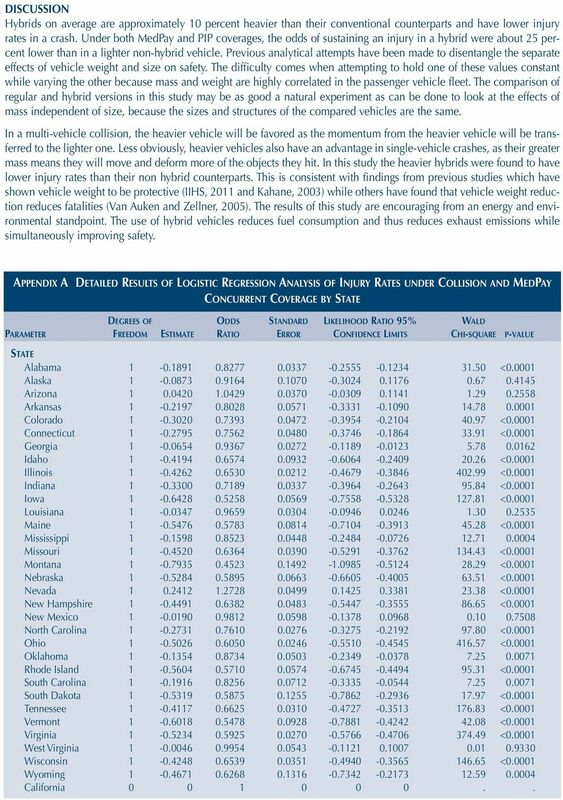 Vehicles studied To be included in this study, a hybrid series had to have an exact conventional counterpart (e.g., Honda Civic hybrid/honda Civic) or had a carefully selected conventional series comparable enough to be used in the pairing, (e.g., Lexus GS 450 hybrid/lexus GS 350). The vehicles also had to have at least one injury claim to be included in the analysis. The Toyota Prius and the Honda Insight were excluded because they do not have conventionally powered counterparts. 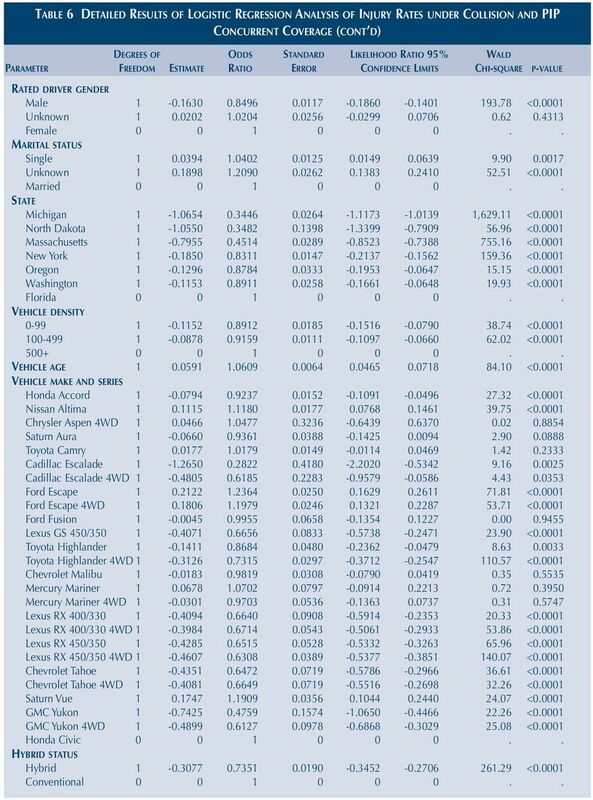 Studied vehicles were models during calendar years with only the four most current model years studied per calendar year. Twenty-seven series pairs were studied in the Collision and MedPay analysis with 4.3 million years of exposure, while 26 series pairs were studied in the Collision and PIP analysis with 5.6 million years of exposure. The curb weights for the most recent model year of all series pairs can be found in Figure 1. Curb weight for hybrids ranged from 2,877 pounds for the Honda Civic hybrid to 6,016 pounds for the Cadillac Escalade hybrid 4WD. Curb weight differences ranged from 3 percent heavier for the hybrid Saturn Aura four-door to 16 percent heavier for the Toyota Highlander four-door hybrid. 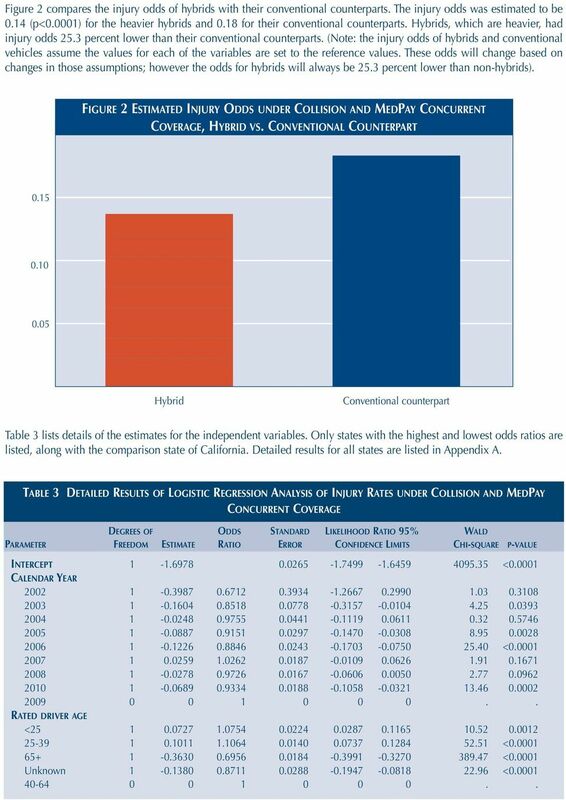 Analysis methods Logistic regression analysis was used to quantify the difference between the injury odds of hybrids and their conventional counterparts while controlling for other factors. The primary predictor was the hybrid status of the vehicle. 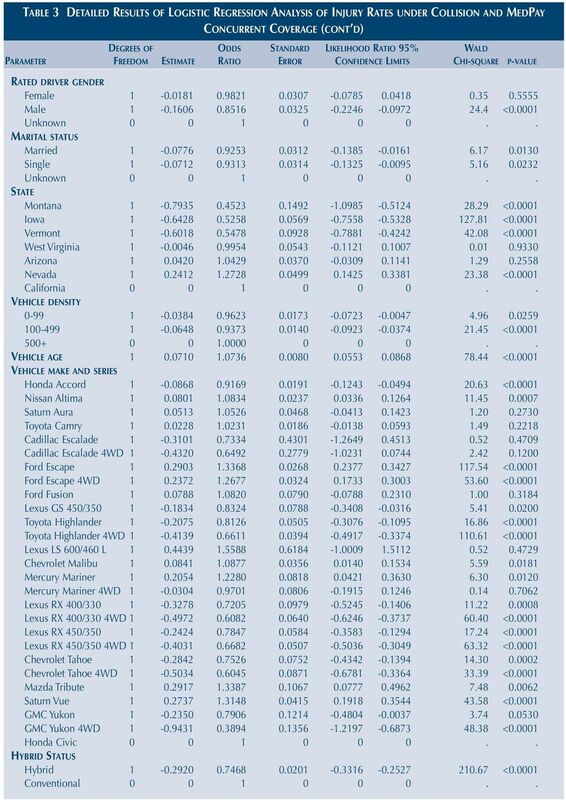 The other independent variables in this analysis included calendar year, rated driver age, rated driver gender, marital status, vehicle density (number of registered vehicles per square mile), garaging state, vehicle series and vehicle age. 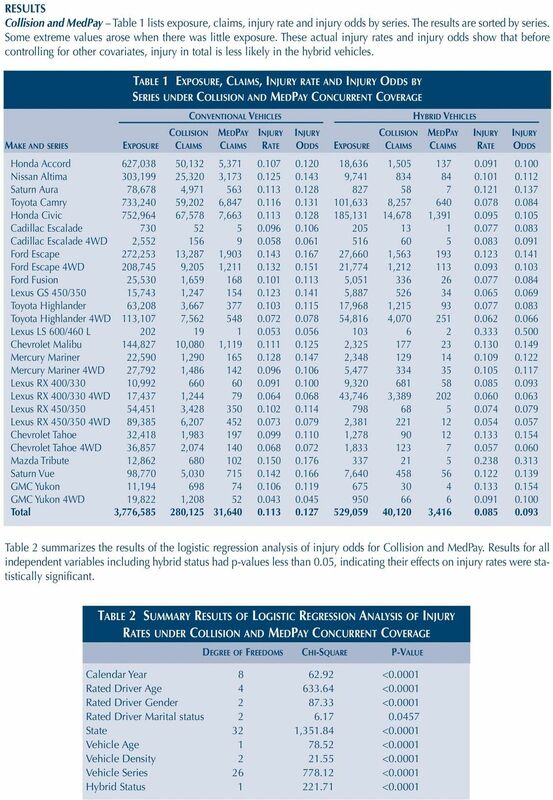 Reference categories for the categorical independent variables were assigned to the values with the highest exposure: calendar year = 2009, rated driver age = 40-64, gender = unknown for Collision and MedPay, female for Collision and PIP, marital status = unknown for Collision and MedPay, married for Collision and PIP, vehicle density = 500+, state = California for Collision and MedPay, Florida for collision and PIP, vehicle series= Honda Civic four-door. Vehicles with an age of -1 (e.g models in 2010 calendar year) were grouped into vehicles with age 0. This logistic regression produces estimates for each variable relative to the reference values for that variable. The exponent of a given estimate corresponds to the odds ratio for a particular value of a variable relative to the reference value for that variable. For example, the reference value for hybrid status was conventional vehicles. 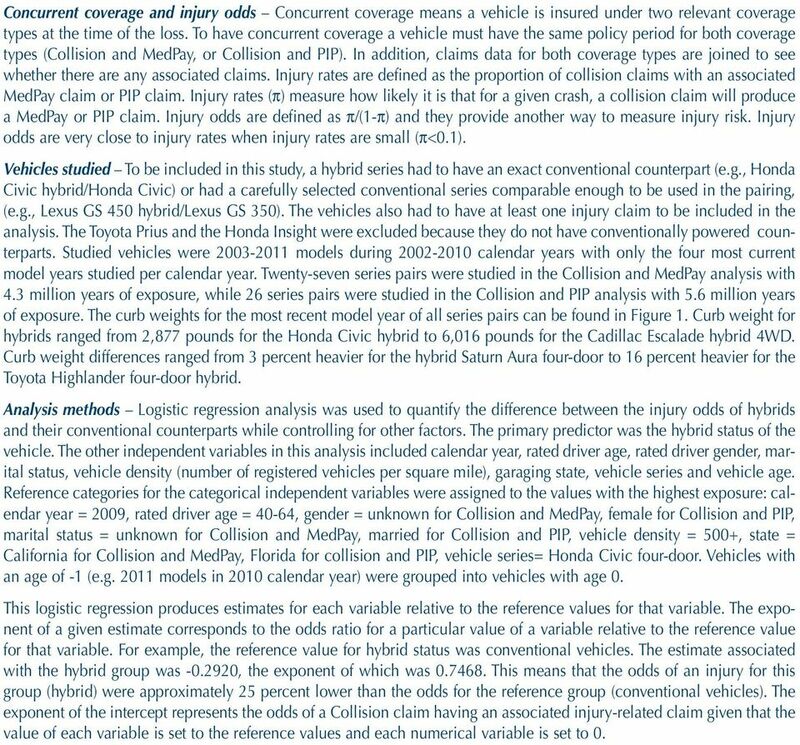 The estimate associated with the hybrid group was , the exponent of which was This means that the odds of an injury for this group (hybrid) were approximately 25 percent lower than the odds for the reference group (conventional vehicles). The exponent of the intercept represents the odds of a Collision claim having an associated injury-related claim given that the value of each variable is set to the reference values and each numerical variable is set to 0. 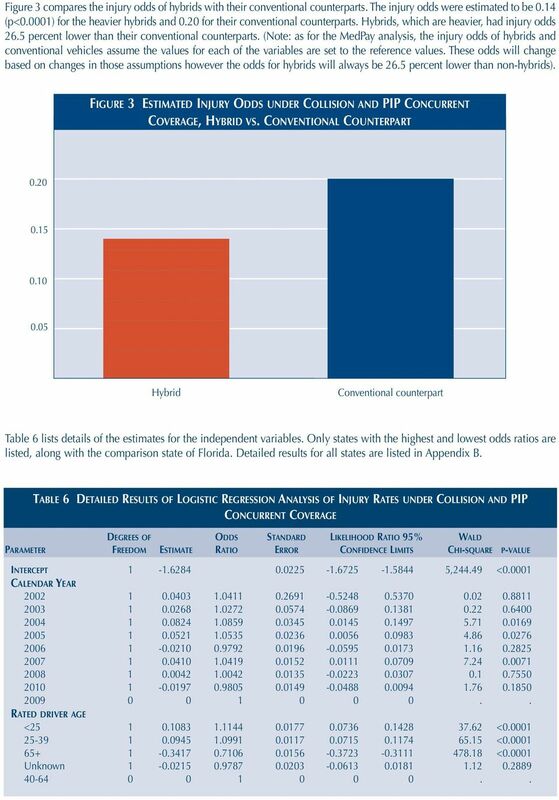 Per vehicle mile traveled, motorcyclists were more than 26 times more likely than passenger car occupants to die in a traffic crash. Traffic Safety Facts 2008 Data Bicyclists and Other Cyclists DOT HS 811 156 Bicyclists and other cyclists include riders of two-wheel nonmotorized vehicles, tricycles, and unicycles powered solely by pedals. Age and Health Insurance: Pricing Out the Decades of Adult Life Looking at the difference in health insurance premiums between ages 20 and 60.